Macao traditionally celebrates the end of the year with barrel-loads of fun and exciting events! Several Christmas carols on Silent Night 2017 and Christmas Markets pump up the atmosphere prior to welcoming in the New Year in squares, hotels and establishments all over town. Taipa Village Cultural Association exclusively presents emerging Portuguese illustrator Ana Aragao's first solo exhibition in Macao as its closing event for its 2017 artistic programme. Hosted by Taipa Village Art Space, the exhibition entitled "Imaginary Beings" will showcase a unique collection of abstract illustrations of building features which are drawn spontaneously in a multitude of different forms and shapes. "As Ana Aragao opens her debut show in Macao, we hope to broaden horizons in two directions: on the one hand, those of the artist, whose current work is inspired by the generic features of local architecture, but who has never set foot on Macanese soil; and on the other, those of local art connoisseurs in understanding that professional illustration also has a place in art galleries," said Joao O, President of the Executive Board, Taipa Village Cultural Association. "Macao Light Festival 2017 - AMOR MACAU" will be staged till December 31. Through fascinating light artistry, the event will portray the harmony in cultural diversity and touching historical stories of the city while passing on the spirit of love. 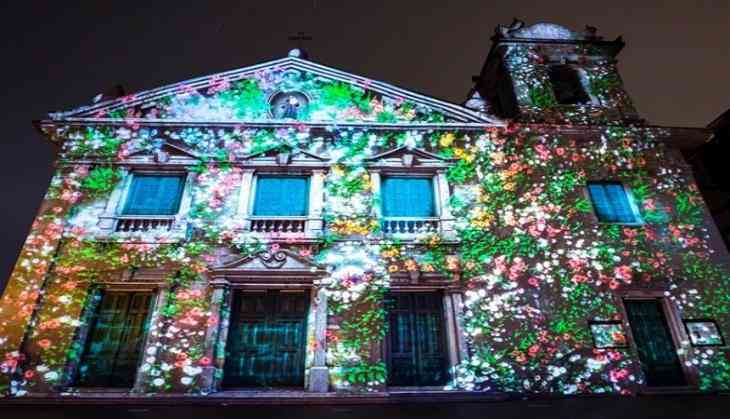 The production team of Macao Light Festival 2017 consists of over a hundred local transmedia creators specialized in diverse areas such as animations, music, films and multimedia. The production team ingeniously combines innovative technology and local artistry with the history and culture of Macao for fascinating displays on local historical architectures, attractions and streets, offering a mega extravaganza of lights belonging just to Macao. The event will bring forth an array of interactive light installations and games designed to enchant the audience and enhance their level of participation. For instance, Anim'Arte Nam Van will be transformed into the "Playground of Lights" set to awaken vibrant and youthful friendships among participants through an amalgam of music, dances, games and so forth. On the other hand, "The Maze of Flowers" at Nam Van Lake Nautical Centre will immerse participants into a mysterious sea of roses and let them project blessing lanterns beneath the canopy next to the maze. In addition, The Light in the Soul - Light Art Exhibition will be held at the exhibition gallery on the ground floor of Oriental Foundation, showcasing artworks with elements of light created by local artists Jose Drummond, Joao Ó and James Chu. Outdoor mini concerts by local musicians and an outdoor screening of the local movie "Love in the City" will be staged in town on schedule for free admission, enabling the audiences to enjoy romantic local productions in the beautiful glow of illuminations. Moreover, the festival will join hands with two local catering establishments to present Light Dinner, an array of feasts that blend light projections and culinary delights into unprecedented dining experiences, riding on the creative momentum given by the designation of Macao as a UNESCO Creative City of Gastronomy.